About fifty percent of heart failure patients have preserved systolic function, which is a condition called heart failure with a preserved ejection fraction and it is attributed to diastolic dysfunction (DD) [1, 2]. These patients tend to be older, and the condition is more prevalent among women . Some conditions predispose patients to DD, including systemic arterial hypertension, diabetes mellitus (DM), and myocardial ischemia . Hypertension and type 2 DM often coexist [3, 4], and diastolic function in diabetic hypertensive patients is worse than that in non-diabetic hypertensive patients . In addition, DD may be associated with worse prognoses for these patients [6, 7]. Endothelial dysfunction (ED) is an early sign of atherosclerosis, it can be detected before coronary heart disease and other macrovascular complications of DM occur [8, 9], and it can be involved in the pathophysiology of cardiac abnormalities in these patients. The endothelium plays a central role in the regulation of arterial tone and blood flow, and it orchestrates the production of nitric oxide, prostacyclin, endothelium-derived hyperpolarizing factor, and vasoconstrictors such as endothelin-1 and angiotensin II . ED is an important element in the pathophysiology of atherosclerosis and it is a predictor of future cardiovascular events [11, 12]. ED in the coronary bed can lead to microvascular coronary dysfunction . Increasing age, systolic blood pressure, body mass index (BMI), and smoking are associated with reductions in flow-mediated dilatation (FMD) . Study findings have shown a relationship between type 2 DM and ED, and there is an association with insulin resistance [10, 12]. A correlation between endothelial function and DD has been demonstrated in patients with type 1 DM [14-16]. Only one study demonstrated the correlation between ED and post-exercise diastolic function indexes in type 2 DM patients, but not with diastolic function indexes at rest . The objective of this study was to compare groups of type 2 DM hypertensive patients with normal and abnormal diastolic functions using endothelial function indexes, and to assess whether correlations exist between diastolic and endothelial function indexes. We selected 46 hypertensive patients of both genders with type 2 DM who were aged between 40 and 70 years and being managed at the outpatient hypertension clinic of the State University of Rio de Janeiro. Patients who required insulin, or had blood pressure > 180/110 mmHg, fasting blood glucose levels > 200 mg/dL, glycosylated hemoglobin (HbA1c) levels > 8.0%, valvar disease, heart failure, angina, previous myocardial infarction or stroke, peripheral vascular disease, stages 3, 4, or 5 kidney disease, arrhythmias were excluded from the study. Patients were evaluated every 4 weeks for an observation period of 12 weeks, during which time their medication status remained stable and monitored. Medication compliance was assessed by counting the patients’ medication cards at each visit, and patients were considered to have complied well when they had used over 80% of the medication during the study period. At the end of the observation period, the patients underwent laboratory tests, which included blood glucose, HbA1c, lipid profile, blood counts, C-reactive protein. Imaging exams were obtained with Vivid 3 ultrasound system (General Electric, USA), using 1.5-3.6 MHz phased array sector transducer for transthoracic Doppler echocardiography and 3.0-7.0 MHz linear array transducer for carotid ultrasound, with intima-medial thickness measurement, and brachial artery echo Doppler for FMD assessment. The following echocardiographic measurements were recorded: mitral flow early (E) and late (A) waves velocities, the isovolumic relaxation time (IVRT), the E-wave deceleration time of the mitral flow, and pulmonary vein systolic, diastolic, and reversal waves flow velocities. The E/A velocity ratio of the mitral flow was calculated . The Tei index was calculated from the IVRT and the isovolumic contraction (IVCT) and ejection time (ET) that were obtained from continuous wave Doppler measurements at the left ventricle outflow tract with the formula: Tei index = (IVCT+IVRT)/ET . Tissue Doppler obtained measurement of the early wave velocities (e') at the septal and lateral mitral annulus and the average E/e' velocity ratio was calculated . The left atrial and ventricular diameters, mass and ejection fraction was obtained from M-mode, left atrial volume was calculated using the area-length equation at two-dimensional and the result was indexed according to the body surface area . Patients were categorized as having normal diastolic function (ND), based on these Doppler measurements: septal mitral annulus e' wave velocity of >8 cm/s, a lateral mitral annulus e’ wave velocity of >10 cm/s, and an indexed left atrial volume of <34 mL/m2 . The patients who exhibited changes in the aforementioned parameters were categorized as having abnormal diastolic function (AD). The DD was graded in accordance with the guidelines as: grade 1 if E/e’ ratios of <8 and E/A ratios of <0.8, grade 2 if E/e’ ratios of between 8 and 12 and E/A ratios of between 0.8 and 1.5 and grade 3 if E/e’ ratio > 12 and E/A ratio > 1.5 . The intima-media thickness was obtained from three measurements in a free of plaque 10-mm segment of distal common carotid arteries and the mean value of both sides was used for analysis . Patients fasted for at least 4 h before the FMD was undertaken. The tests were carried out with the patient in the supine position and with the right arm compressed for 5 min using a cuff. The right brachial artery diameter was recorded before cuff inflation, and at 30, 60, and 90 s after cuff deflation, and the highest of these three values was used to calculate the maximum FMD as a percentage of increase above the baseline diameter [22, 23]. Statistical analyses were performed using Statistical Package for Social Sciences, Version 18.0 (IBM, Chicago, USA). Unpaired Student’s t-test was used to compare the ND and AD groups. Pearson’s test was used to determine correlations between variables related to diastolic and endothelial function. 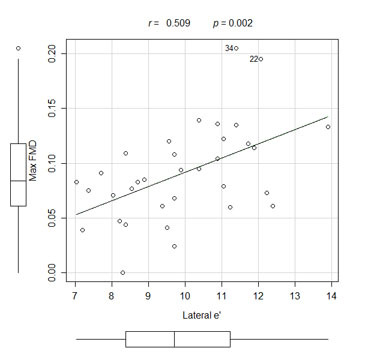 P values < 0.05 were considered statistically significant. We used previous studies of FMD in similar populations to estimate the sample size . Assuming an alpha error of 5% and a standard deviation of 3.5%, a sample size of 14 patients in each group had an 80% power to detect a 4% difference in the FMD between the groups at the end of the study. All of the patients provided signed informed consent before the study began. This study was approved by the State University of Rio de Janeiro Hospital’s research ethics board, and it was conducted in accordance with principles outlined in the Declaration of Helsinki. Invasive procedures were not conducted. The study was registered in the Clinical Trials Registry (Clinical trial registration number: NCT01603940). During the observation period, 12 patients were excluded from the study because of new onset atrial fibrillation (n = 1), deep venous thrombosis (n = 1), need for insulin therapy was needed (n = 9) and patient's urge to quit the study (n = 1). The other thirty-four patients were categorized based on Doppler measurements as ND (n = 14) and AD (n = 20). In the AD group, seven patients had grade 1 DD, 13 patients had grade II DD and none of the patients had grade 3 DD. Table 1 summarizes the epidemiological, clinical, and laboratory data from the patients in the ND and AD groups. The patients were treated in accordance with the current guidelines for the treatment of hypertension and DM [25, 26]. All patients took the calcium channel blocker, amlodipine, and a renin-angiotensin-aldosterone system inhibitor, specifically, losartan or benazepril. In the ND group, 57% of the patients took losartan and 43% of the patients took benazepril, and in the AD group, 50% of the patients took losartan and 50% of the patients took benazepril (p = 0.467). With regard to oral antidiabetic agent, metformin was used in 91% and glibenclamide in 38% of the patients. The patients in the AD group were older (58 ± 6 years vs 55 ± 6 years, p = 0.071) and had a lower BMI than those in the ND group (28.6 ± 4.4 vs 31.8 ± 4.8, p = 0.053), but without statistical significance. 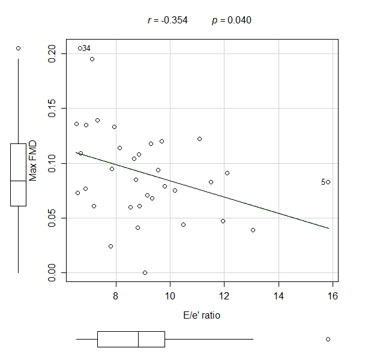 At logistic regression analysis only the C-reactive protein level showed an influence with the FMD results (R = -2.411, p = 0.035), although this parameter did not differ between the groups. Table 2 summarizes echocardiographic parameters. Table 1. Comparison of the patients in the normal and abnormal diastolic function groups. Table 2. Echocardiographic parameters in patients with normal and abnormal diastolic functions. 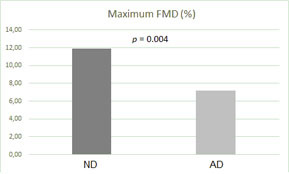 The endothelial function indexes assessed by FMD were worse in the AD patient group than in the ND patient group (Fig. 1). There were correlations between the maximum FMD and the E/e' ratio (Fig. 2), the mitral A wave velocity, the e' wave velocity at the lateral mitral annulus (Fig. 3), and between the maximum FMD and the Tei index (Table 3). Fig. (1). Maximum FMD in patient with normal and abnormal diastolic function. (FMD flow mediated dilation, ND normal diastolic function, AD abnormal diastolic function). Table 3. Correlations between the maximum flow-mediated dilatation and diastolic function. Fig. (2). Correlation between maximum FMD and E/e' ratio. (FMD flow mediated dilation, E/e' velocities ratio between mitral flow E wave and mean mitral annulus e' wave). Fig. (3). Correlation between maximum FMD and e' wave velocity at the lateral mitral annulus. (FMD flow mediated dilation). The intima-media thickness was greater in AD group (0.86 ± 0.10 vs. 0.77 ± 0.12 mm, p = 0.039). Our results showed that endothelial function in the brachial arteries of the diabetic hypertensive patients with DD was worse than that in the diabetic hypertensive patients with ND. Furthermore, correlations existed between the endothelial function indexes and the diastolic function indexes, which have been demonstrated in studies of patients with type I DM [14-16]. We believe that ED is involved in the pathophysiology of patients with DD, and that this can be observed before the diastolic changes are detected. It is thought that the mechanisms involved in the genesis of ED and DD are similar, and that neurohumoral factors may be involved in the pathophysiology of both ED and DD. Furthermore, improvements in ED and DD following treatment with angiotensin-converting enzyme inhibitors (ACEI) support this hypothesis . A correlation between the degree of ED and the severity of heart failure has been demonstrated, but it remains unclear whether DD is aggravated by the progression of ED . The correlation between ED and diastolic function may be associated with the widespread dysfunction of nitric oxide production that would reduce diastolic compliance by increasing contraction duration, but it would have little or no effect on systolic function . Other mechanisms include coronary ED that causes subendocardial ischemia, which is a factor that leads to changes in diastolic function and in the paracrine function of the coronary endothelium, that predisposes individuals to hypertrophy and myocardial fibrosis . The greater intima-media thickness in the AD group suggests a widespread vascular envolvement, and this same finding was found in other studies assessing diastolic and endothelial function in type I DM [14-16]. In one study there was a correlation between intima-media thickness and FMD , but we didn’t found this correlation in our sample. Some antihypertensive agents have beneficial effects on endothelial function [8, 24, 27, 31]. In our sample patients were treated in accordance with the current treatment guidelines and all received a drug that acts on the renin-angiotensin-aldosterone system associated to an calcium channel blocker [4, 26] Hypertensive diabetic patients frequently require more than one drug to control their blood pressure and this combination seems to be the most effective . The differences in antihypertensive regimens in our sample have no statistical significance, beyond the fact that ACEI and angiotensin receptor blockers have similar beneficial effects on endothelial function [8, 24, 27, 31], which, in comparative studies, have been shown to be greater than the effects of beta-blockers and calcium channel blockers [8, 27]. The pathophysiology of DD is unclear and analyzing its correlation with ED could open up a new field of research. Indeed, determining whether ED precedes the onset of DD and whether the progression of DD correlates with the deterioration of ED is an area of research that is of particular importance. We believe that ED research using FMD could add value to the risk stratification of hypertensive diabetic patients, and FMD is a noninvasive and low-cost method. Furthermore, applying this research to non-hypertensive diabetic patients may be important. Diabetic cardiomyopathy was described a few years ago, and it is characterized by alterations in the structure and function of the myocardium, including DD, regardless of the presence of hypertension or coronary atherosclerosis [32-35]. However, the pathophysiology of these changes remains unclear and it is important to determine the role of ED in this process. One limitation of our study relates to the small number of patients who were enrolled to participate in the study. Our outpatient clinic has a large number of diabetic patients; however, most of them fulfilled one or more of the study’s exclusion criteria that mostly included the presence of coronary artery disease, heart failure, arrhythmia, or advanced renal disease, or they were being treated with insulin. Another limitation of our study was the coexistence of type 2 DM with hypertension in all of the patients, both of which contribute to DD. Type 2 DM patients are more likely to be hypertensive, and about 50% of patients with type 2 DM are found to be hypertensive at the time of diagnosis . Thus, the patient sample studied represented a significant proportion of the population and a higher risk group for which the detection of early changes could have more significant prognostic implications. However, studying patients with type 2 DM who do not have coexisting hypertension will be important to determine whether the same correlations exist when the influence of hypertension is absent, which has already been shown for patients with type 1 DM . In conclusion, the findings in our study indicate that endothelial function was worse in hypertensive diabetic patients with abnormal diastolic function than in hypertensive diabetic patients with normal diastolic function, and that there were correlations between diastolic function and endothelial function indexes. Further prospective longitudinal studies are necessary to confirm these findings. We would like to thank Editage (www.editage.com.br) for English language editing. Sanderson JE. Heart failure with a normal ejection fraction. Heart 2007; 93(2): 155-8. Owan TE, Redfield MM. Epidemiology of diastolic heart failure. Prog Cardiovasc Dis 2005; 47(5): 320-32. Hypertension in Diabetes Study (HDS): I. Prevalence of hypertension in newly presenting type 2 diabetic patients and the association with risk factors for cardiovascular and diabetic complications. J Hypertens 1993; 11(3): 309-17. Reboldi G, Gentile G, Angeli F, Verdecchia P. Choice of ACE inhibitor combinations in hypertensive patients with type 2 diabetes: update after recent clinical trials. Vasc Health Risk Manag 2009; 5(1): 411-27. Felício JS, Pacheco JT, Ferreira SR, et al. Hyperglycemia and nocturnal systolic blood pressure are associated with left ventricular hypertrophy and diastolic dysfunction in hypertensive diabetic patients. Cardiovasc Diabetol 2006; 5: 19. Pieske B, Wachter R. Impact of diabetes and hypertension on the heart. Curr Opin Cardiol 2008; 23(4): 340-9. Nichols GA, Hillier TA, Erbey JR, Brown JB. Congestive heart failure in type 2 diabetes: prevalence, incidence, and risk factors. Diabetes Care 2001; 24(9): 1614-9. Shahin Y, Khan JA, Samuel N, Chetter I. Angiotensin converting enzyme inhibitors effect on endothelial dysfunction: a meta-analysis of randomised controlled trials. Atherosclerosis 2011; 216(1): 7-16. Çiftel M, Ertuğ H, Parlak M, Akçurin G, Kardelen F. Investigation of endothelial dysfunction and arterial stiffness in children with type 1 diabetes mellitus and the association with diastolic dysfunction. Diab Vasc Dis Res 2014; 11(1): 19-25. Tabit CE, Chung WB, Hamburg NM, Vita JA. Endothelial dysfunction in diabetes mellitus: molecular mechanisms and clinical implications. Rev Endocr Metab Disord 2010; 11(1): 61-74. Inaba Y, Chen JA, Bergmann SR. Prediction of future cardiovascular outcomes by flow-mediated vasodilatation of brachial artery: a meta-analysis. Int J Cardiovasc Imaging 2010; 26(6): 631-40. Sitia S, Tomasoni L, Atzeni F, et al. From endothelial dysfunction to atherosclerosis. Autoimmun Rev 2010; 9(12): 830-4. Benjamin EJ, Larson MG, Keyes MJ, et al. Clinical correlates and heritability of flow-mediated dilation in the community: the Framingham Heart Study. Circulation 2004; 109(5): 613-9. Shivalkar B, Dhondt D, Goovaerts I, et al. Flow mediated dilatation and cardiac function in type 1 diabetes mellitus. Am J Cardiol 2006; 97(1): 77-82. Eltayeb AA, Ahmad FA, Sayed DM, Osama AM. Subclinical vascular endothelial dysfunctions and myocardial changes with type 1 diabetes mellitus in children and adolescents. Pediatr Cardiol 2014; 35(6): 965-74. Ravikumar R, Deepa R, Shanthirani C, Mohan V. Comparison of carotid intima-media thickness, arterial stiffness, and brachial artery flow mediated dilatation in diabetic and nondiabetic subjects (The Chennai Urban Population Study [CUPS-9]). Am J Cardiol 2002; 90(7): 702-7. Leung M, Phan V, Leung DY. Endothelial function and left ventricular diastolic functional reserve in type 2 diabetes mellitus. Open Heart 2014; 1(1): e000113. Nagueh SF, Appleton CP, Gillebert TC, et al. Recommendations for the evaluation of left ventricular diastolic function by echocardiography. J Am Soc Echocardiogr 2009; 22(2): 107-33. Tei C, Ling LH, Hodge DO, et al. New index of combined systolic and diastolic myocardial performance: a simple and reproducible measure of cardiac function-a study in normals and dilated cardiomyopathy. J Cardiol 1995; 26(6): 357-66. Lang RM, Badano LP, Mor-Avi V, et al. Recommendations for cardiac chamber quantification by echocardiography in adults: an update from the American Society of Echocardiography and the European Association of Cardiovascular Imaging. J Am Soc Echocardiogr 2015; 28(1): 1-39.e14. Touboul PJ, Hennerici MG, Meairs S, et al. Mannheim carotid intima-media thickness consensus (2004-2006). An update on behalf of the Advisory Board of the 3rd and 4th Watching the Risk Symposium, 13th and 15th European Stroke Conferences, Mannheim, Germany, 2004, and Brussels, Belgium, 2006. Cerebrovasc Dis 2007; 23(1): 75-80. Corretti MC, Anderson TJ, Benjamin EJ, et al. International Brachial Artery Reactivity Task Force. Guidelines for the ultrasound assessment of endothelial-dependent flow-mediated vasodilation of the brachial artery: a report of the International Brachial Artery Reactivity Task Force. J Am Coll Cardiol 2002; 39(2): 257-65. [Erratum in: J Am Coll Cardiol 39:1082]. Gismondi RA, Oigman W, Bedirian R, Pozzobon CR, Ladeira MC, Neves MF. Comparison of benazepril and losartan on endothelial function and vascular stiffness in patients with Type 2 diabetes mellitus and hypertension: A randomized controlled trial. J Renin Angiotensin Aldosterone Syst 2015; 16(4): 967-74. [Epub ahead of print]. Flammer AJ, Hermann F, Wiesli P, et al. Effect of losartan, compared with atenolol, on endothelial function and oxidative stress in patients with type 2 diabetes and hypertension. J Hypertens 2007; 25(4): 785-91. Rydén L, Standl E, Bartnik M, et al. Task Force on Diabetes and Cardiovascular Diseases of the European Society of Cardiology (ESC); European Association for the Study of Diabetes (EASD). Guidelines on diabetes, pre-diabetes, and cardiovascular diseases: executive summary. Eur Heart J 2007; 28(1): 88-136. American Diabetes Association. Standards of medical care in diabetes--2012. Diabetes Care 2012; 35(Suppl. 1): S11-63. Ma LN, Zhao SP, Gao M, Zhou QC, Fan P. Endothelial dysfunction associated with left ventricular diastolic dysfunction in patients with coronary heart disease. Int J Cardiol 2000; 72(3): 275-9. Uslu N, Eren M, Gorgulu S, et al. Left ventricular diastolic function and endothelial function in patients with erectile dysfunction. Am J Cardiol 2006; 97(12): 1785-8. Elesber AA, Redfield MM, Rihal CS, et al. Coronary endothelial dysfunction and hyperlipidemia are independently associated with diastolic dysfunction in humans. Am Heart J 2007; 153(6): 1081-7. Aksnes TA, Skårn SN, Kjeldsen SE. Treatment of hypertension in diabetes: what is the best therapeutic option? Expert Rev Cardiovasc Ther 2012; 10(6): 727-34. Li S, Wu Y, Yu G, Xia Q, Xu Y. Angiotensin II receptor blockers improve peripheral endothelial function: a meta-analysis of randomized controlled trials. PLoS One 2014; 9(3): e90217. Okoshi K, Guimarães JF, Di Muzio BP, Fernandes AA, Okoshi MP. Miocardiopatia diabética. Arq Bras Endocrinol Metabol 2007; 51(2): 160-7. Codinach Huix P, Freixa Pamias R. Diabetic cardiomyopathy: concept, heart function, and pathogenesis. Med Interna 2002; 19(6): 313-20. [Article in Spanish]. Sowers JR, Epstein M, Frohlich ED. Diabetes, hypertension, and cardiovascular disease: an update. Hypertension 2001; 37(4): 1053-9. Uusitupa MI, Mustonen JN, Airaksinen KE. Diabetic heart muscle disease. Ann Med 1990; 22(6): 377-86.